Working with Oracle File and FTP adapter is definitely like black magic! I have SOA 11.1.1.6.0. I need to use FTP adapter to copy a file from a remote server. Both FTP and File adapters are designed to read a file, not to copy a file. If you want to copy a file and not process it, you have to jump through the hoops. I sifted through 3 versions of "Oracle® Fusion Middleware, User's Guide for Technology Adapters, 11g Release" (11.1.1.6.0, 11.1.1.6.2 and 11.1.1.6.3). Part of the document is inaccurate to say the least.I even tried to look up the adapter java classes (Oracle_OSB1\lib\external\adapters\ftpAdapter.jar) looking for clues. In the end, I resorted to trial and error, and with the help of network sniffing to sort out the mess. I created a synchronous BPEL, selected all default. References swim lane. The Adapter Configuration Wizard Welcome page is displayed. 3. Click Next. The Service Name page is displayed. 4. Enter a service name in the Service Name field. Default "Define from operation and schema (specified later) is checked. 6. Click Next. The FTP Server Connection page is displayed. JDev default might be "eis/ftp/FtpAdapter", however, SOA server default may be eis/Ftp/FtpAdapter.Look closely, you may need to change the 2nd part from "ftp" to "Ftp" (upper case "F"). do not overlook that "FTPMove". This is part of the black magic, it has to be precisely spelled like that, or you will be doomed. Why can't there be a drop down selection of "FTPMove"? If you have to enter specific text, what's the point of using an IDE. 9. Enter a dummy physical path for the directory for incoming files, and then click Next. The File name page is displayed. Note: The dummy directory is not used. You must manually change the directory in a later step. This is misleading. You can put real path in here, and the adapter uses it if you don’t overwrite it dynamically in BPEL code. Same applies to the other parameters. 10. Enter a dummy file name, and then click Next. The File Name page is displayed. 11. Click Next. The Messages page is displayed. 13. Click Finish. The outbound Oracle File Adapter is now configured. zone that appears as a green triangle in FTPMove in the External References area. The BPEL component is connected to the Oracle FTP Adapter outbound service. 15. Click File, Save All. 16. Create an invoke activity for the FTPMove service that you just created. configure it with the new interaction specification for the move operation. You must configure the JCA file with the source and target directory and file details. You can either hardcode the source and target directory and file details in the JCA file or use header variables to populate them. In this example, header variables are used. sourceFileName, targetDirectory, and targetFileName variables. 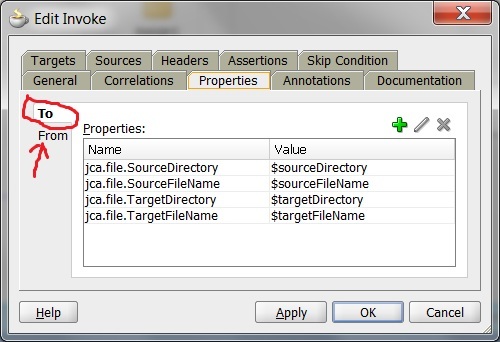 variables override the parameters in the JCA file. A few notes here, do NOT use the UI and select the “properties”, these properties do not show up in the list, AND the properties show up in the list do NOT work L (for example, jca.ftp.FileName would look like a perfect choice, but it is misleading, it does not work!). Additionally, there are “To” and “From” properties I can’t find any documents about these choices. I finally figured out (network sniffing) that “to” appears to be what used to be called “input” properties. I would assume “from” would be the same as old “output” properties. 19. Finally, add an initial receive or pick activity. You have completed moving or renaming a file from a remote directory to another remote directory on the same FTP server. If you created a default BPEL, you may already have your receive activity. Run your test, that should take move “/test/input/input.txt” to “/test/output/output.txt” on the same FTP server. Very good, and quite helpful. Is it possible to implement FTPMOVE operation using OSB? Thanks for the input. We have a requirement where we need to read files from a remote server (the file directory and file name would be provided at run time). Can you help me with the same? Nice post. Like it , thanks very much. One question. What if we want to move all the files in a directory. What will be the TargetFileName?